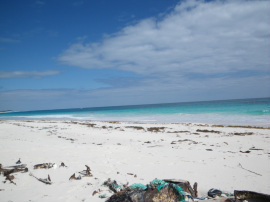 You will find directions to Sponge Cove in the Elusive Beaches of Eleuthera. The access point is just past the airport. The road and parking area consist of very soft sand, making it very easy to get stuck so please be aware. I would not recommend going here in a sedan. The beach itself is sheltered from the wind and very picturesque. As far as snorkeling and swimming there is a abundance of sea grass here so we would not recommend it. It is a great habitat for spotting sea turtles, and sharks. We did not see any sea turtles when we were there but we did see a very good size shark close to shore. Airport Beach consists of three miles of one of the most spectacular pink sand beaches on the Atlantic side of the island. It is so long that it is generally describes as 3 different beaches, north, central and south. The southern end used to have a beach access but when we were there last it was a private road and there was construction taking place. As far as we know it is not longer accessible unless you are renting a home in the area. 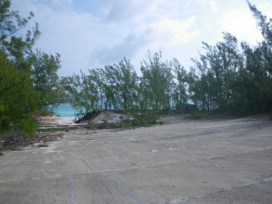 Central airport beach is closest to the actual airport and near the abandoned U.S Naval base. The ocean can be bit rougher here and tends to have larger waves, but on a calm day is still wonderful for swimming. The snorkeling is not very good as most of the reefs here are in poor condition. North airport beach is just as spectacularly beautiful as the rest of the beach but the water is rougher here than the rest of the beach and there is an undertow so we do not recommend swimming or snorkeling here. In 1950 the U. S. began building a naval base on Eleuthera as a demonstration SOSUS (sound surveillance system) to track soviet submarines. A few years later the base was greatly expanded and it became part of the Air Force Missile Test Centers Atlantic missile range. In coordination with eleven other stations around the Caribbean they were responsible for long range monitoring of rocket and guided missile launches, etc. for the Air Force, Army and Navy. In 1980 it was officially decommissioned and abandoned. Now all that remains is the abandoned buildings and overgrown vegetation. 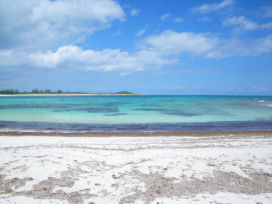 Alabaster Beach is the quintessential Caribbean beach. The shallow sandy beach extends for almost an entire mile and is perfect for wading, swimming and shelling. 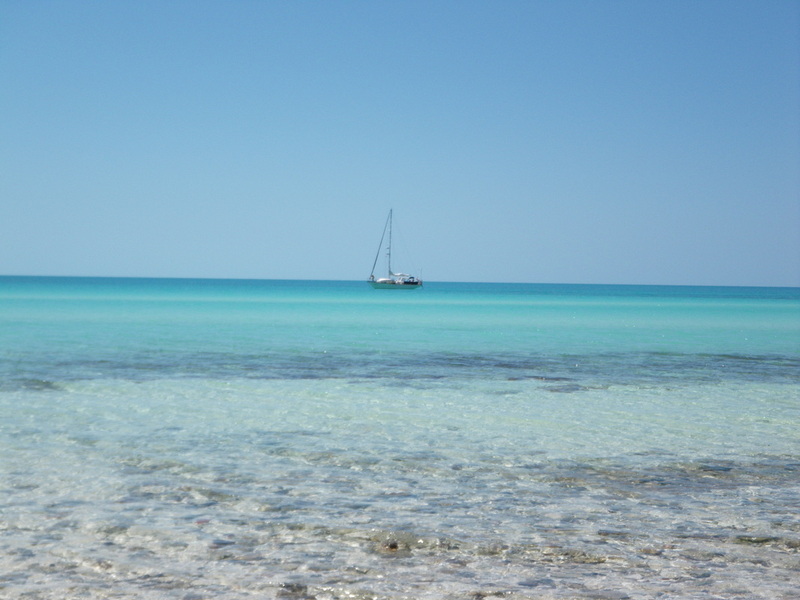 This beach is typically very calm and the shallow water makes it an excellent beach for children. While you are there stop for lunch or a cocktail at Cocodimama. To get to Alabaster Beach, also called Receivers Beach turn at the Cocodimama sign (one mile south of GHB or just under 7 miles north of Governors Harbour). Follow the road just past Cocodimama, as it veers to the left. Find a place to park and head to the beach. Twin Cove is a unique and beautiful beach on the Atlantic side of Eleuthera. 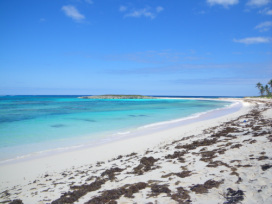 Twin Cove, as it's name clearly states is two little coves separated by a small patch of sand that connects the main island to Bluff Cay. Both of the little coves are great for swimming or snorkeling. To get to Twin Cove Beach from the north go 6.2 miles south of GHB till you see a large white building with a blue roof on the right called the Workers House. Take your first left after you pass the workers house. If you are traveling from the south go 1.65 miles north from Eleuthera Supply and take a right just before the Workers House. Follow this road till the top of the hill, where you will get to a 4 way intersection, go straight through (the road veers to the right) and go down the hill toward the ocean. At the bottom of the hill will reach at the T, take a right at then go 0.3 miles down this sandy road, there will be a pullout on the left. To get to the other side of the cove, go 0.4 miles down the road, past a house with a landscaped coconut grove. At the far edge the property where the landscaping ends, there will be a small path to your left. Park and follow the path to the beach. 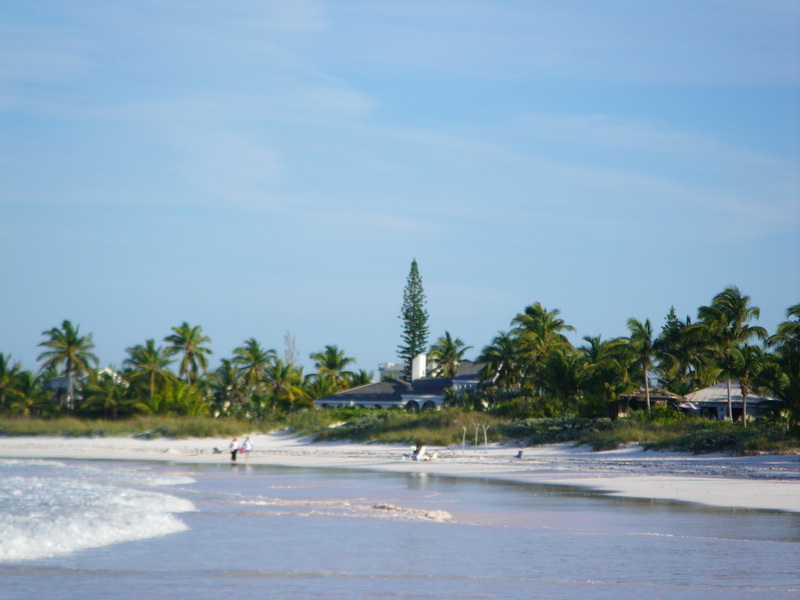 This beach is one of the most widely known beaches on the Atlantic side. Despite its fame even the busiest days here are far from crowded. 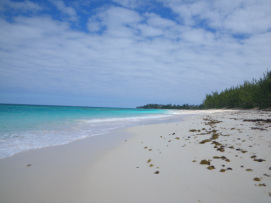 It is arguably one of the nicest beaches on the island, and the most conveniently located Atlantic side beach if you are staying in the Governors Harbour area. This beautiful pink sand beach stretches for over a mile and is a great place for swimming and snorkeling. The offshore reefs keep the water pretty calm here, especially for the Atlantic side. This beach gets its nickname from the old Club Med Resort and you can see the ruins of the old resort from the beach. The resort was destroyed in 1999 by hurricane Floyd and never rebuilt. There is a plan in the works to rebuild the resort under the name French Leave Resort in the near future. They have just completed construction of a handful of beautiful villas right next to Governors Harbour on the sea side. 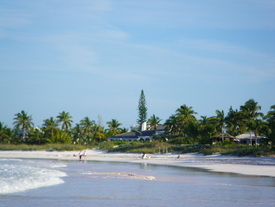 While you are visiting this fabulous beach don’t forget to stop at the Beach House Bar and Restaurant for a snack and a cocktail. To get here from Governors Harbour, turn up the hill at the yellow Pyfroms Liquor store building. Go to the top of the hill and take a right at the stop sign. You are now on Banks Road, follow it for 0.8 miles and you will see a sandy road on your left. Turn and park in the shade, then walk down to the beach; don’t forget to lock your car here. If you reach the Beach House you went a little too far, but you can continue on, for a total of one mile from the stop sign and you will see another beach access on the left just after the last house. Poponi Beach is another beautiful Atlantic beach near Governors Harbour. It is very comparable to Club Med Beach only a bit longer. 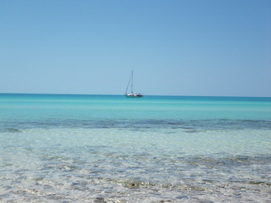 It is also a fabulous beach for swimming and snorkeling. To get here go into North Palmetto point and follow the signs for Unique Village. You will reach a T intersection with a huge silk cotton tree. Turn right at the T (still following the signs for Unique Village) and go 0.2 miles and take the first left after the road curves to the right, you will see a small blue and white building that says Poponi. Follow the dirt road a short ways, till you reach the parking area. The road is actually a private drive for the Poponi Beach House but the owners are nice enough to keep it open for people to use, so please respect them and their property. Unique Village is only about a quarter mile away so don’t forget to stop for a drink or a bite to eat. S & T. Squires and Governors Est.